PORT MORESBY, Nov. 16 (Xinhua) — Visiting Chinese President Xi Jinping and Papua New Guinea (PNG) Prime Minister Peter O’Neill agreed on Friday to establish a comprehensive strategic partnership between their countries, featuring mutual respect and common development. 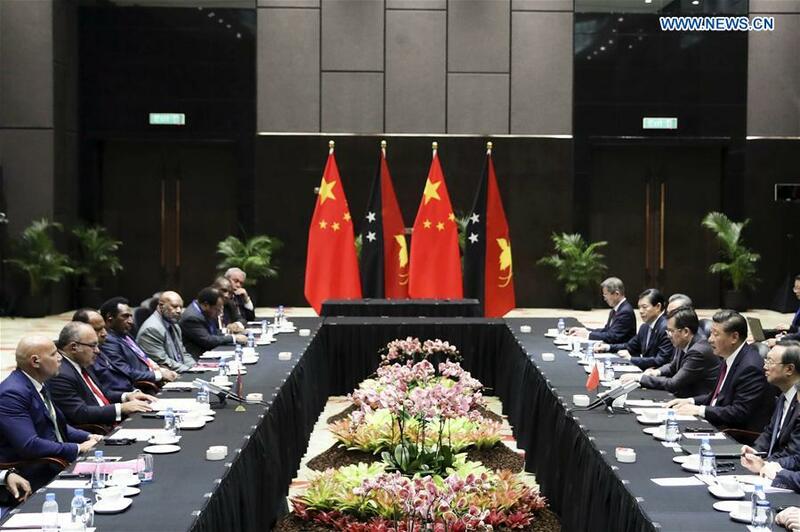 The decision was made during a meeting between Xi and O’Neill, where they spoke positively of the traditional friendship between China and PNG and charted the course for the development of bilateral relations. Expressing gratitude to the PNG government and people for the warm reception, Xi said it was an epitome of the profound friendship the PNG people have for the Chinese people and a reflection of the development of bilateral relations and the achievements in bilateral cooperation in years. Xi pointed out that the two countries have enjoyed frequent high-level exchanges and fruitful results in practical cooperation in recent years. China firmly supports PNG in choosing a development path in line with its own national conditions and highly appreciates the PNG government for staunchly adhering to the one-China policy, he said. The two sides agreed to establish a comprehensive strategic partnership featuring mutual respect and common development to strengthen political guidance for bilateral relations, he said. Xi said the development embodied the traditional friendship between China and PNG while injecting strong impetus into the advancement of bilateral exchanges and cooperation. China is ready to work with PNG to increase mutual trust, deepen cooperation and foster friendship to lift the comprehensive strategic partnership to higher levels, he added. Xi stressed that both sides should increase strategic mutual trust under the guidance of high-level exchanges. He called on the two sides to keep promoting personnel exchanges at various levels and in various fields and strengthening communication between parties, parliaments, at local levels and among peoples. The two sides, Xi said, should achieve win-win and mutually beneficial results underpinned by practical cooperation. Noting that PNG, located on the natural extension of the 21st Century Maritime Silk Road, was the first among Pacific island countries to sign a cooperation agreement on the Belt and Road construction with China, Xi called on the two sides to strengthen the alignment of their development strategies within the Belt and Road framework. He also called on the two sides to reach a consensus as soon as possible to start negotiations on a free trade agreement, and actively promote the mutually beneficial cooperation in such areas as production capacity, trade and economy, investment and financing. The two sides should consolidate friendship between the two peoples based on cultural exchanges, Xi said, adding that they should also advance cooperation in the fields of the facilitation of personnel exchanges, human resources development, education, health and tourism. China and PNG should enrich the content of their cooperation with multilateral coordination as a platform, Xi said. He said that China is ready to strengthen communication and coordination with PNG within the United Nations, the Asia-Pacific Economic Cooperation (APEC), the Association of Southeast Asian Nations Regional Forum, the Pacific Islands Forum and other multilateral frameworks. China supports PNG in hosting the APEC Economic Leaders’ Meeting and wishes the event a success, the Chinese president added. For his part, noting that it is the first-ever state visit by the Chinese president to PNG, O’Neill said the visit is an important historic moment for his country. PNG and China have enjoyed strong momentum in developing the bilateral relations since the two countries established diplomatic ties, he said, adding that PNG will staunchly adhere to the one-China policy. PNG thanked China for its long-term and precious support in the country’s economic and social development, the Chinese medical team for its help in malaria control and prevention in remote areas, and the Chinese side for its assistance in disaster relief and reconstruction after a recent earthquake, O’Neill said. The country also thanked China for its support in hosting the APEC Economic Leaders’ Meeting. The Belt and Road Initiative is conducive to strengthening connectivity and infrastructure construction in the Pacific islands region, he said. Pledging to actively participate in building the Belt and Road, the prime minister said PNG is willing to beef up communication and cooperation with China in areas including trade and economy, production capacity, tourism, infrastructure construction, education and cooperation among local governments, and start negotiations on a free trade agreement at an early date. The PNG side speaks highly of China’s adherence to rule-based international order in global affairs, supports multilateral institutions, and appreciates and supports China’s active leading role, he said. The PNG side is ready to strengthen coordination and cooperation with the Chinese side, supports Pacific island countries and China in deepening dialogue and strengthening cooperation in areas such as fishery, tourism and climate change, he said. The two leaders witnessed the signing of multiple bilateral cooperative documents following the meeting.